The 50 state quarters were released by the United States Mint every ten weeks, or five each year. They were released in the same order that the states ratified the Constitution. Each quarter's reverse commemorated one of the 50 states with a design emblematic of its unique history, traditions and symbols. Certain design elements, such as state flags, images of living persons, and head-and-shoulder images of deceased persons were prohibited. The authorizing legislation and Mint procedures gave states a substantial role and considerable discretion in determining the design that would represent their state. The majority of states followed a process by which the governor solicited the state's citizens to submit design concepts and appointed an advisory group to oversee the process. Governors submitted three to five finalist design concepts to the secretary of treasury for approval. Approved designs were returned to the states for selection of a final design. 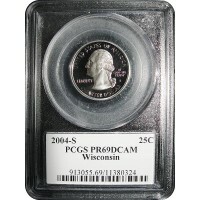 This is the 2004-S Clad Proof Strike of the Wisconsin Washington Quarter graded by PCGS as PR69DCAM (Proof 69 Deep Cameo). The 50 state quarters were released by the United States Mint every ten weeks, or five each year. Th..